TLD ACU-802S-CUP (formerly known as the TLD ACU-802-CUP) Series Air Conditioning units provide maximum passenger comfort in all types of aircraft. 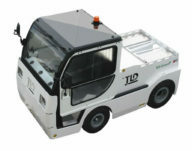 Available in a wide variety of configurations, these units meet the requirements of all aircraft operators regardless of fleet size or local ambient conditions. Using R-134a refrigerant, the ACU-802S Series are environmentally “Safe” causing no damage to the atmospheric ozone. The units employ an air-to-air type refrigeration system, and for operators requiring heat, can be supplied with an optional reverse-cycle “heat pump” system. Provisions are made to utilize engine coolant heat to augment the reverse-cycle heat mode. The “change-over” from one mode to another is so simple that it can be performed by the operator on the ramp while the unit is in service. There are no dangers of combustion or its by-products near the aircraft. 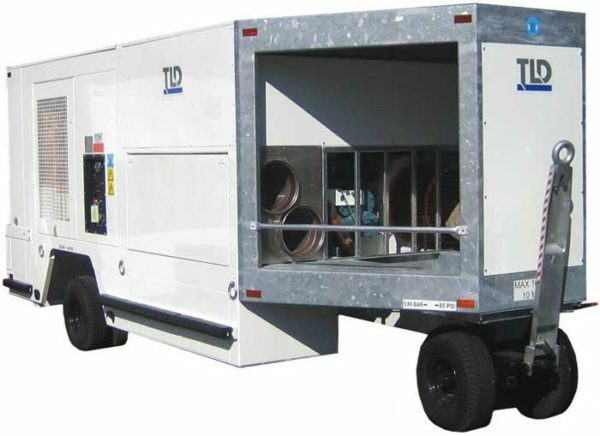 The TLD ACU-802S-CUP air conditioning unit can be configured as either a skid or trailer-mounted 5th wheel unit. Rotary screw compressor with two mated helicallygrooved rotors. Rotary motion ensures reduced vibration and uniform continuous gas flow over a wide range of evaporating and condensing temperatures. Compressor is not sensitive to liquid slugging. Automatic capacity control for increased efficiency. Direct drive system which avoids the intermediate step of converting fuel power into electric power as is necessary with common "diesel electric" systems. This approach insures the lowest fuel consumption, minimal maintenance and highest reliability on the market.